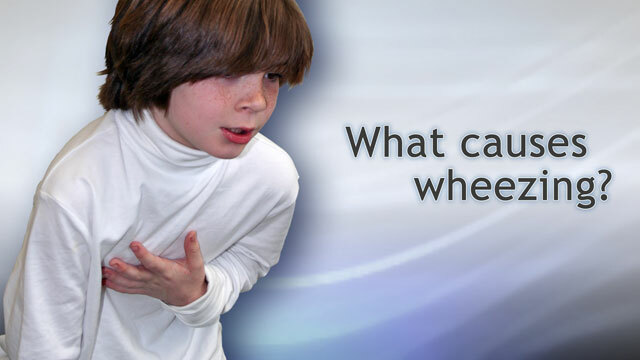 Wheezing is a sign that a person may be having breathing problems. The sound of wheezing is most obvious when breathing out (exhaling). It may also be heard when breathing in (inhaling). Wheezing most often comes from the small breathing tubes (bronchial tubes) deep in the lungs. But it may be due to a blockage in larger airways or in persons with certain vocal cord problems. Take all of your medicines as directed. Sitting in an area where there is moist, heated air may help relieve some symptoms. This can be done by running a hot shower or using a vaporizer. If wheezing is severe or occurs with severe shortness of breath, you should go directly to the nearest emergency department. The provider will perform a physical exam and ask about your medical history and symptoms. Questions about your wheezing may include when it started, how long it has lasted, when it is worse, and what might have caused it. The physical exam may include listening to the lung sounds (auscultation). If your child has the symptoms, the provider will make sure your child didn't swallow a foreign object.